In Maidenhead, we’ve had the promise of new restaurants and bars for a while, but while we wait for the regeneration plans to kick off fully, I find that many people seem to nip to Marlow or Windsor for a night out. 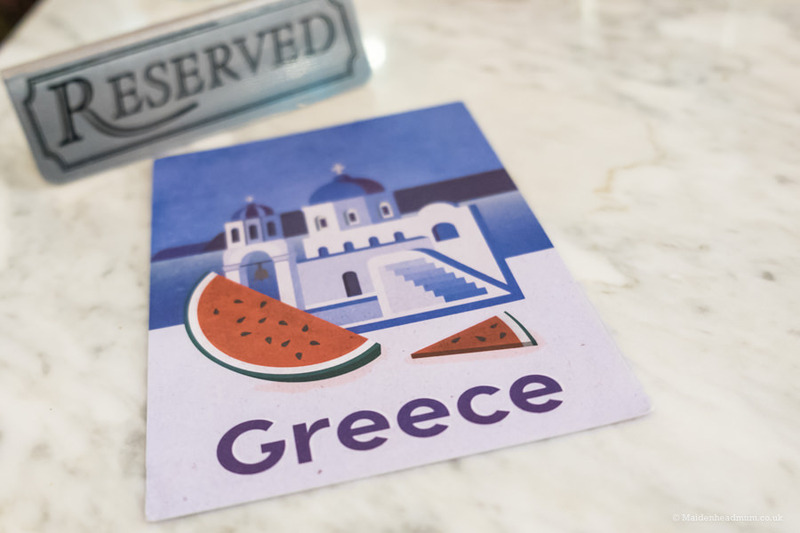 The Real Greek Restaurant in Reading claims to offer mouthwatering Mediterranean flavours, fresh Greek food, a vibrant atmosphere and it’s all local to Maidenhead! 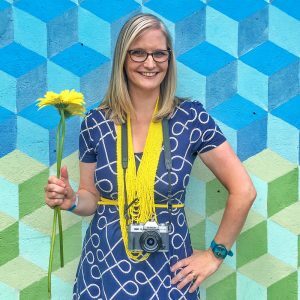 It was enough to inspire me to travel a little bit further for a night out. 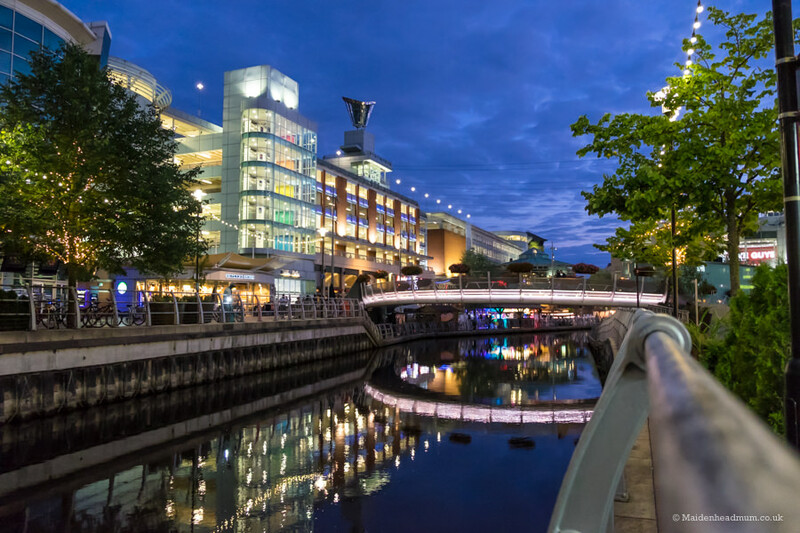 It’s pretty easy to get to Reading by train, and if you can manage to walk, or get a lift to the station, it’s actually a much cheaper way of having a night out than going to Marlow or Windsor. 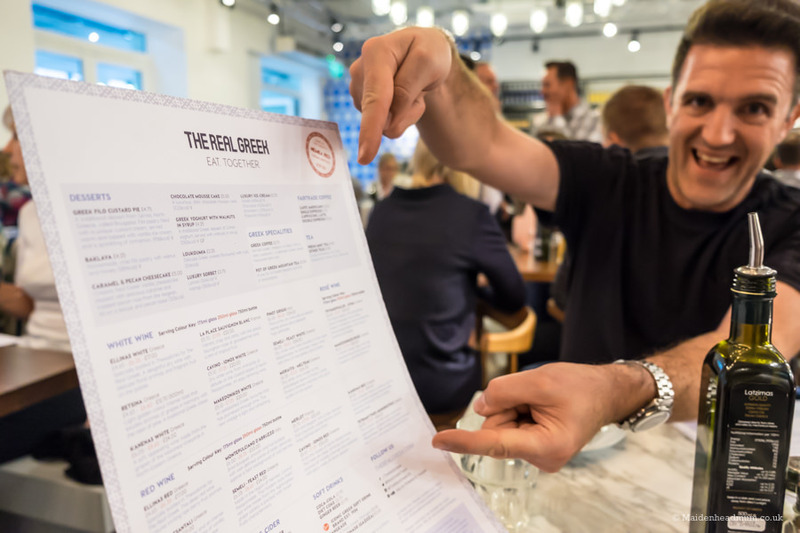 The Real Greek in Reading is part of a chain of 13 restaurants including locations in Shoreditch, Soho, Bournemouth, and Windsor. 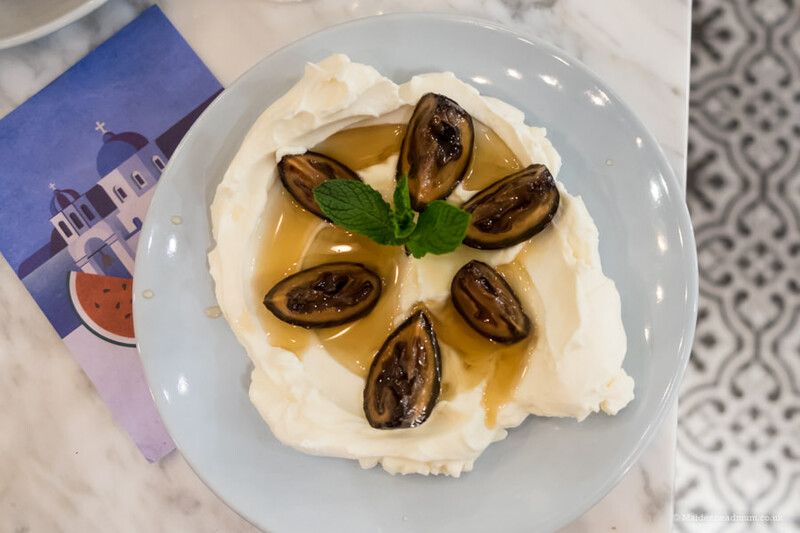 They aim to create the dishes with ingredients from Greece or Cyprus whenever they can. 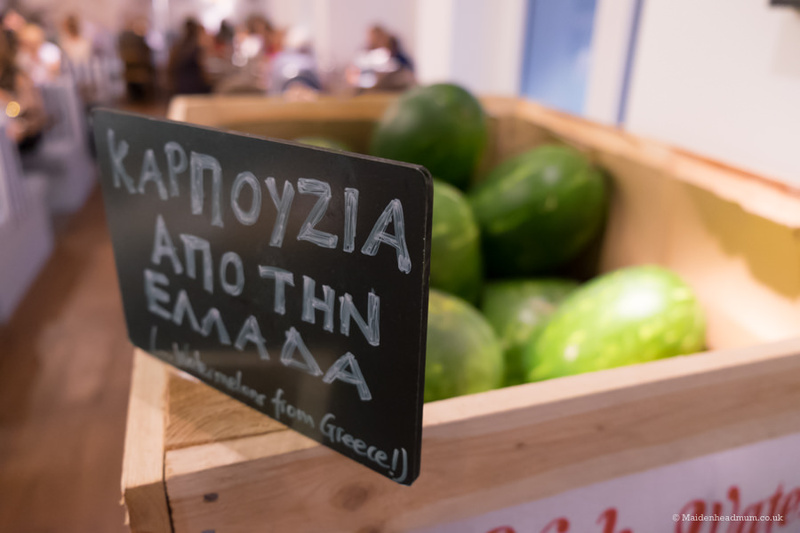 There was a huge crate of enormous Watermelons that had arrived from Greece just a few days ago when we visited. 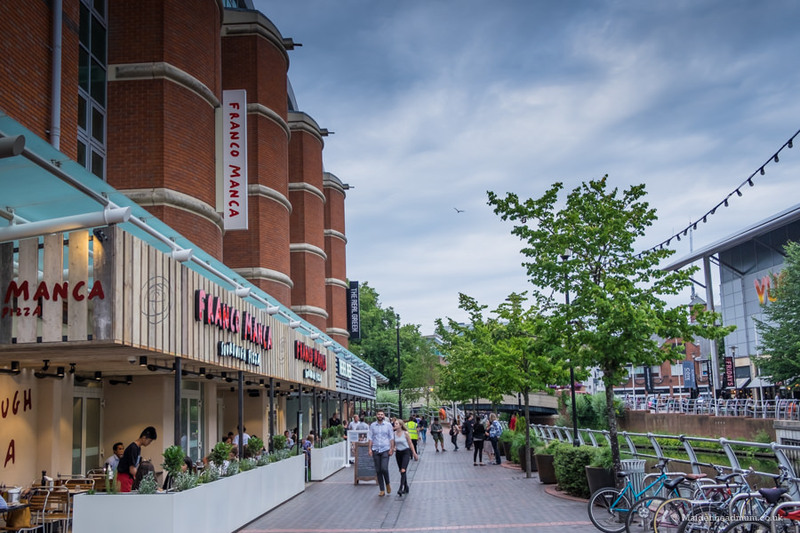 The restaurant has a cosmopolitan location on the riverside, behind The Oracle shopping Centre and has additional seating outside for the warmer times of the year. 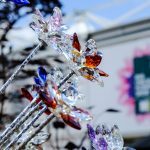 If you only ever to head to Reading for a spot of Saturday shopping (guilty as charged! ), then the Riverside area in the evenings is a treat. Having previously lived on Camden lock in the centre of London, there are times that the city gal in me misses the bright lights and bustle of the ‘Big Smoke’. Even mid week on a Wednesday night, there was a buzzing, vibrant atmosphere: it was almost holiday like! 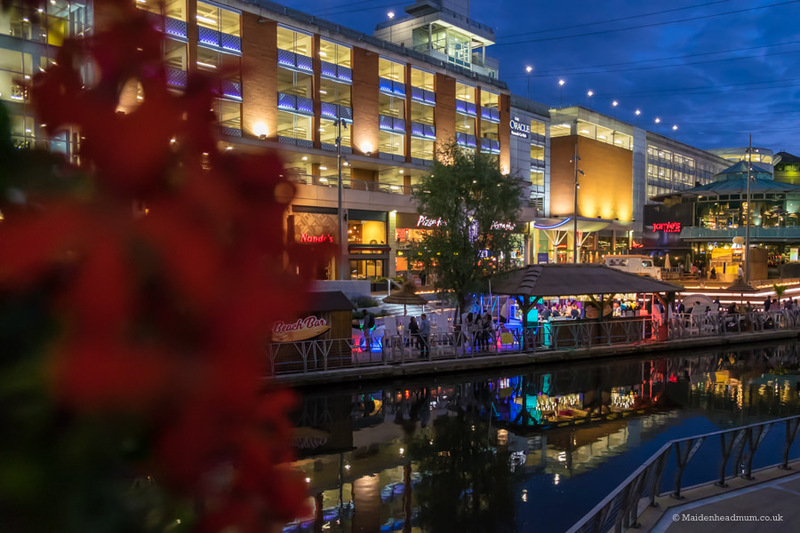 Reading waterside at night looked pretty with the lights reflecting in the water. 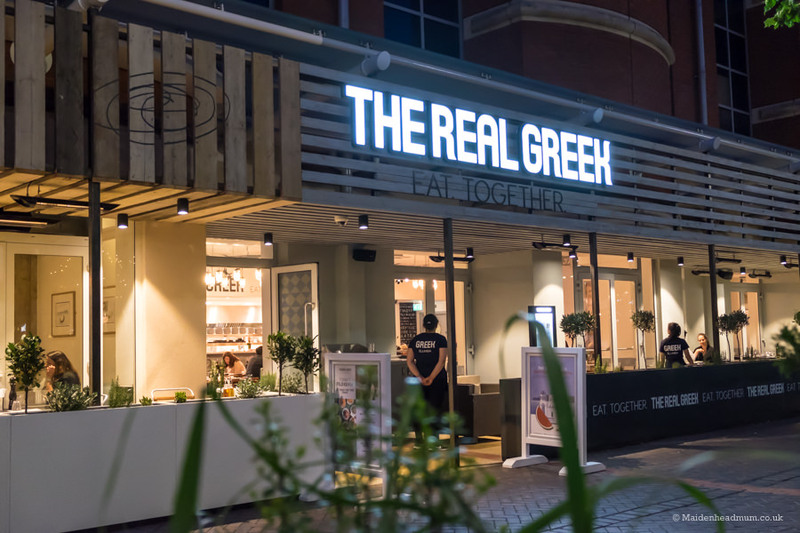 The Real Greek in Reading is next to Debenhams in the Oracle Shopping Centre. Even on a ‘school night’, Reading was buzzing. 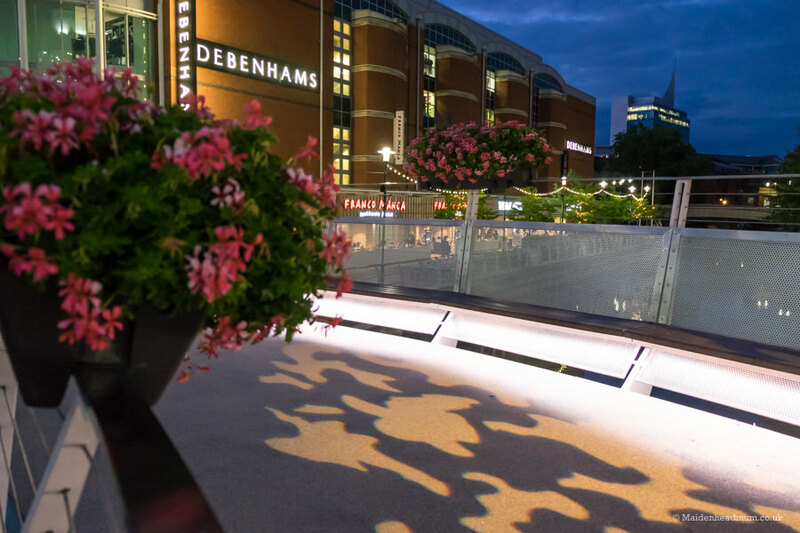 Our table was booked for 7.30pm which meant that we hopped onto to the 19.08 train from Maidenhead and then walked from Reading station, through the Oracle shopping centre (which was still open!) to the Real Greek Restaurant. Not ideal in heels, but I’m all about the sandals at the moment! On our way home we walked up by the taxi rank and along the side of the shopping centre back towards the high street. You can choose to sit inside or outside. It was a bit nippy when we went so we chose a table inside. Inside the restaurant, it’s light, bright and open plan. The kitchen is right in front of you which adds to the atmosphere and hustle and bustle. My husband was very excited by the range of food on offer on the menu as he has fond memories of trips to Greece in his childhood. He was happy to dive straight in and choose dishes. 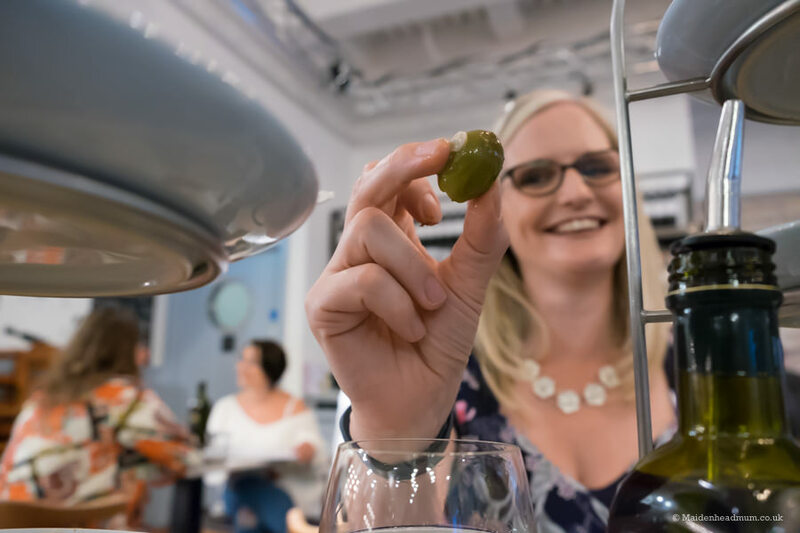 Seeing as Tonia Buxton, TV presenter of ‘My Greek Kitchen’ was on hand to offer some expert advice; I was happy to let her make some recommendations. Mr H was excited to see dishes that he remembered from family holidays to Greece. 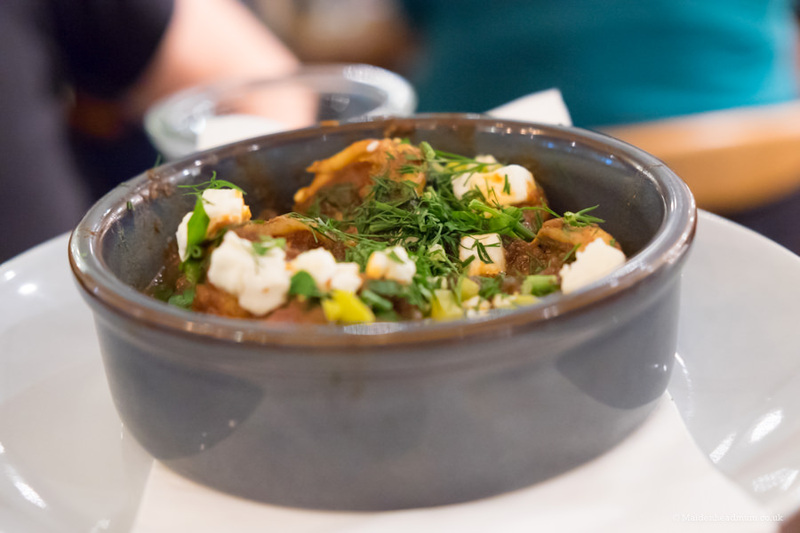 The idea of meze food is to order a mix of dishes which can be shared. It’s not really a ‘first course’, ‘second course’ kind of place. 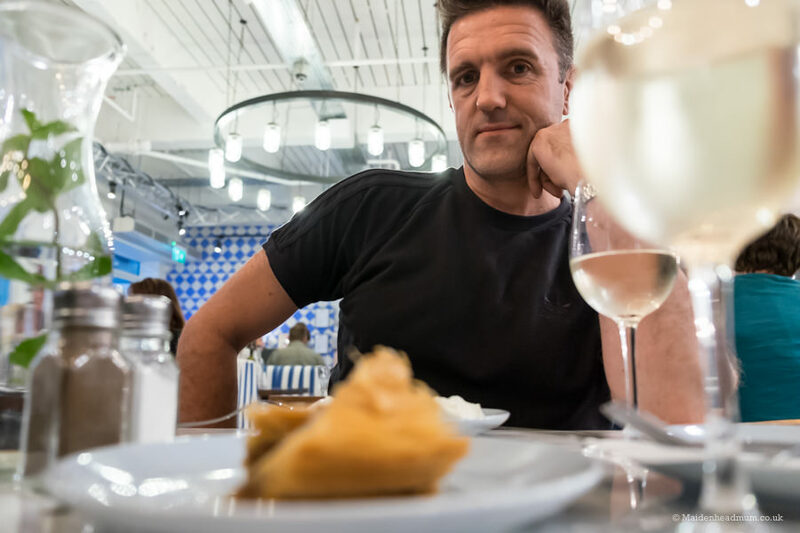 My other half is a bit funny about sharing food that he’s chosen, (if you’ve watched Gavin and Stacey, imagine Smithy talking about his Bhuna) so be sure to forewarn anyone with you if they feel the same! 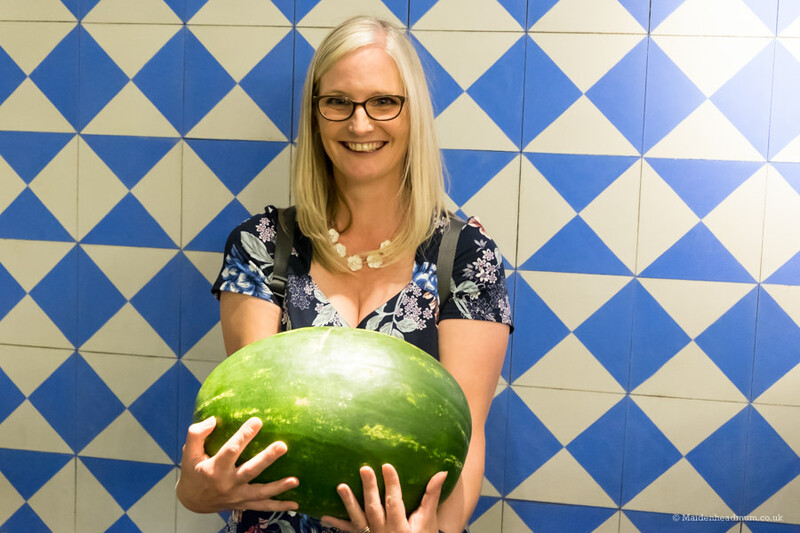 The restaurant prides itself on fresh food, so our first choice was a watermelon and feta salad. This was fresh, crisp and mouth wateringly tasty. 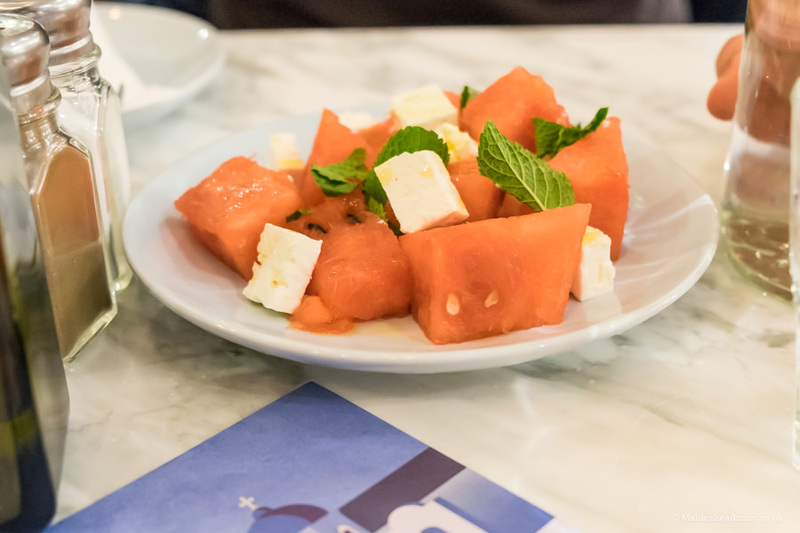 I’d not paired watermelon with feta before, but it was a surprisingly good mix. 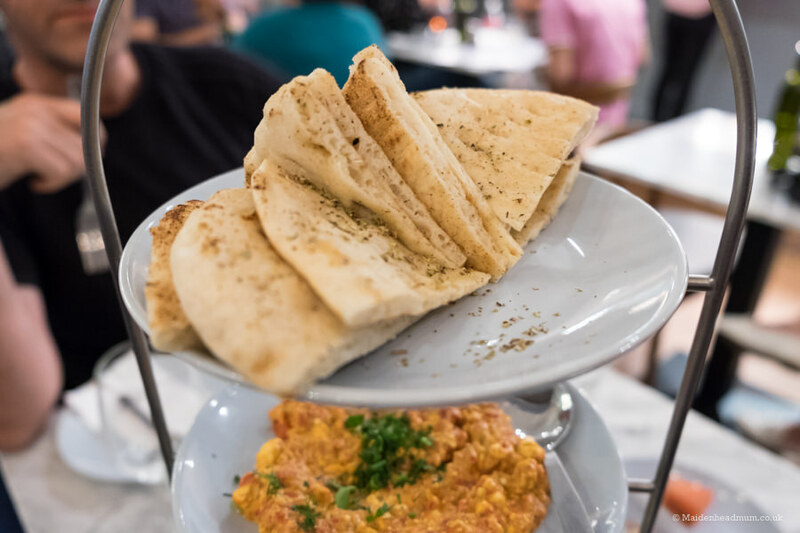 Tonia advised us to stick to just two dips so that we didn’t get too full up, so we chose the Spicy Feta and the Green Pea Fava dip which came with toasted flatbread. We then chose a further three plates to share: Lamb Meatballs, Salted Cod and Garlic and Chilli Tiger Prawns, all of which were beautifully cooked and presented. Dishes were served piping hot, and it felt as if they had been cooked with care and had come straight from a family kitchen. 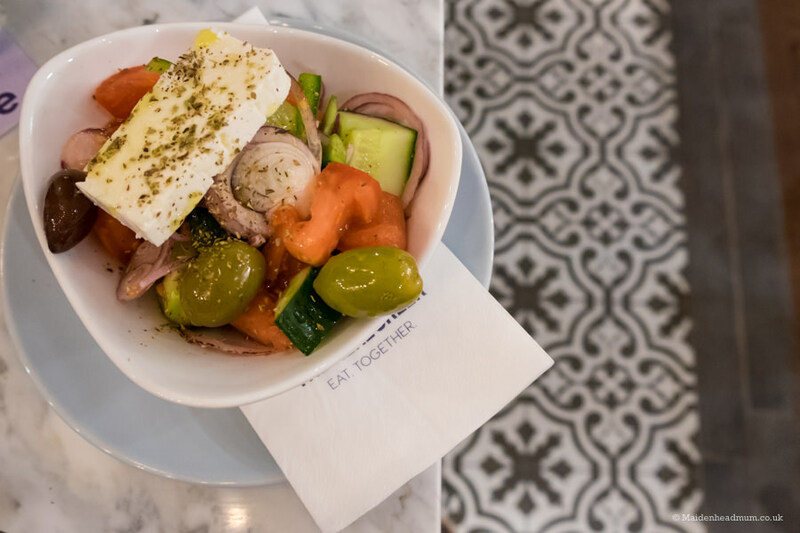 The only thing that I felt was missing from our order was a bit more greenery to balance out the meat and fish dishes, so I added a Greek salad to our order which had tasty olives and a little more feta. 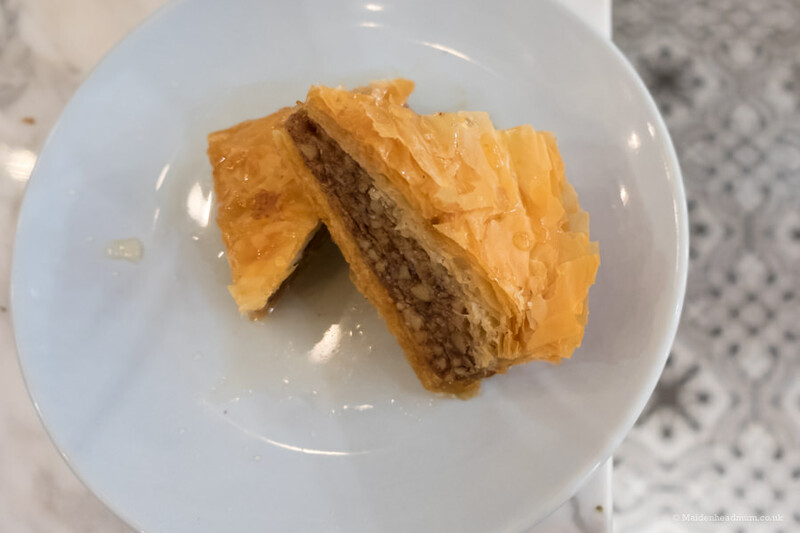 For those of you not familiar with Greek food, I’ve included details from the restaurant menu to help explain the dishes we tried. 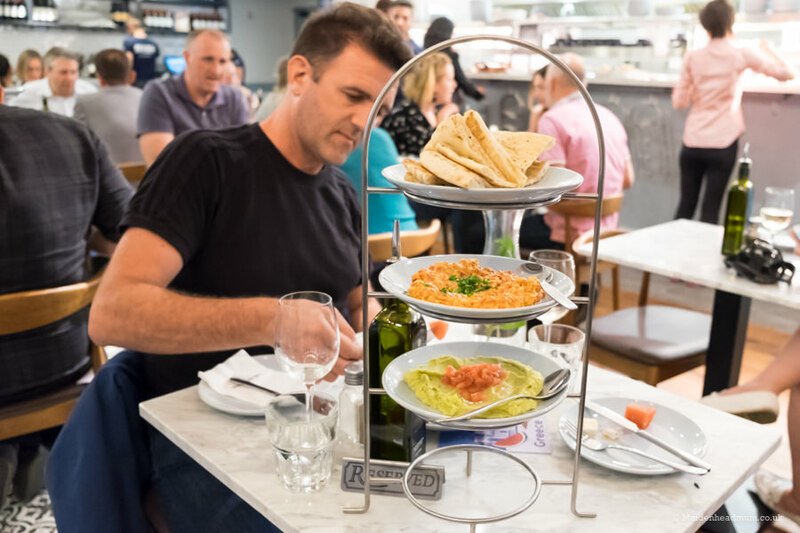 The mezes are served on these cool plate stacks. Cold meze come first then the rest follow when they are ready. 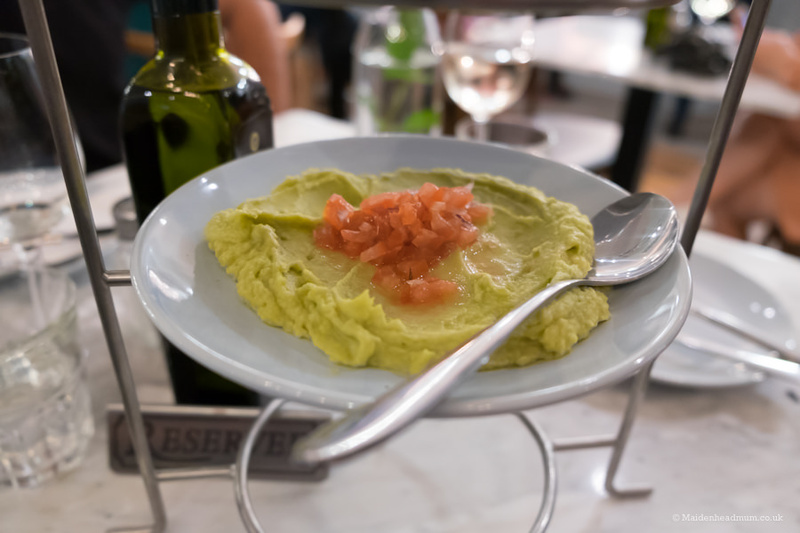 Green Pea Fava (‘Mashed green peas with olive oil and lemon, topped with red onions and tomatoes’). This is the Greek version of mushy peas but soooo much nicer! 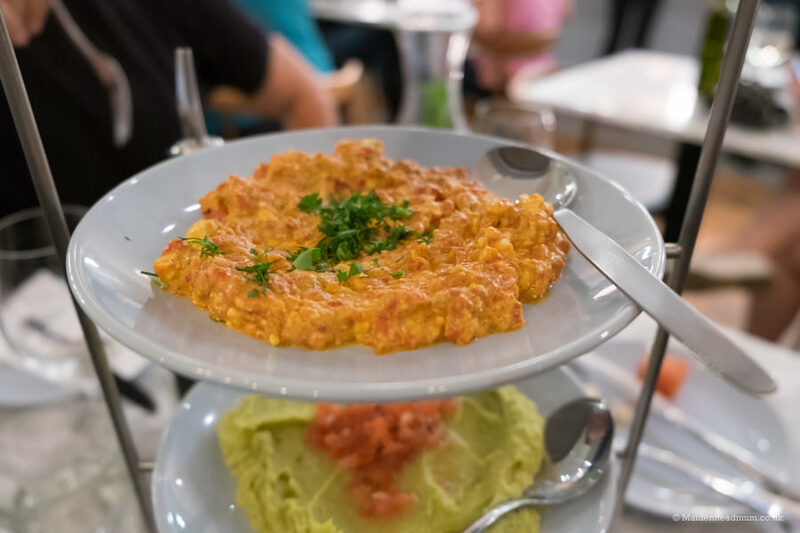 Htipiti or Spicy Feta Dip: (Roasted pepper and cheese dip finished with a touch of chilli). My husband enjoyed the white Retsina, a classic Greek wine. Olives are my favourite but my husband isn’t so keen! This volume of food was perfect for two and by the time the dessert menu was offered we were both really full. But it would have been rude to go home without trying the Greek yoghurt or the baklava! We ordered deserts to share… or at least I did! Hubby not so sure about that. We had a great time! The food was delicious, and there was a lively atmosphere in the restaurant. We always seem to end up in a Pizza restaurant, so this made a refreshing change. 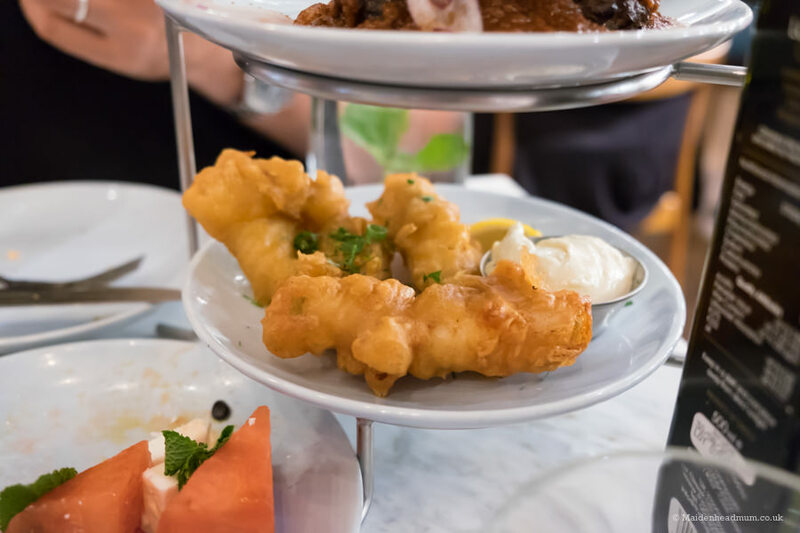 I feel that it’s somewhere you could go again and again as there are so many different dishes on the menu and you can only eat so much at one time! The menu is so varied and has plenty of options that are Gluten Free, vegeterian and even vegan. 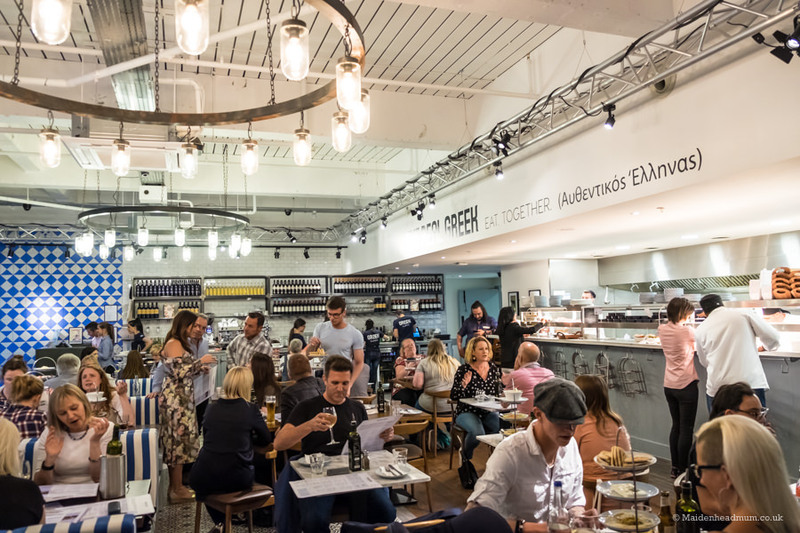 We went on a grown up ‘date night’, but The Real Greek are keen to encourage families to eat and enjoy time together too. 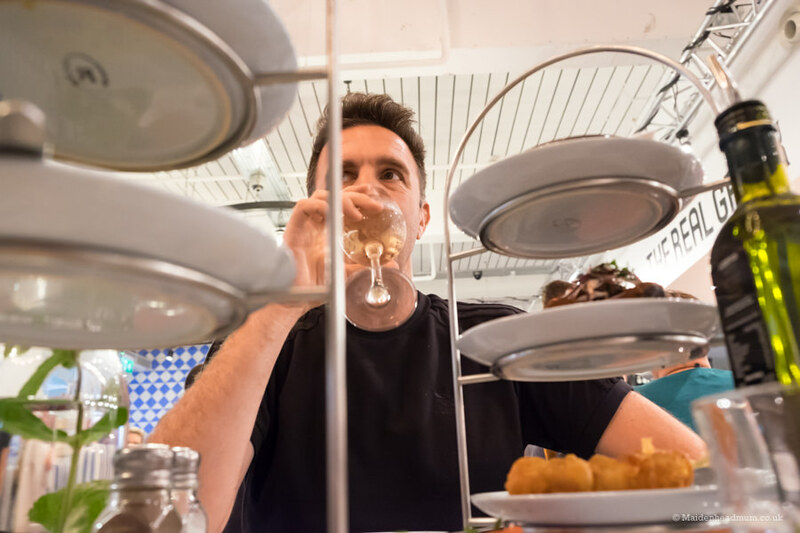 I think my five year old would have loved seeing the way the dishes were served on the plate stacks, but it would have been crazy with our two years old! Just too much for him to grab and knock over. We found it really simple getting home from the restaurant too, with trains running regularly to Maidenhead until midnight. We jumped in a cab from Maidenhead station, and we were home for our babysitter by 11.15. With two small children, I’ll confess that we don’t get out and about that much. I find that by the time you account for a babysitter and a return taxi to Marlow, you’ve nearly spent £50 before you even got to a bar or restaurant. 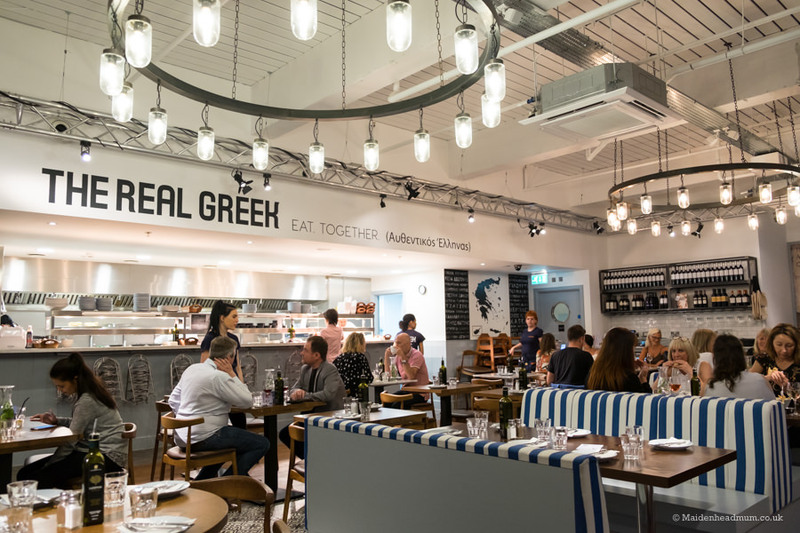 A night out in Reading is a viable alternative for us and I would happily recommend the Real Greek for a ‘date night’ or catch up with friends. I couldn’t resist the photo opportunity. 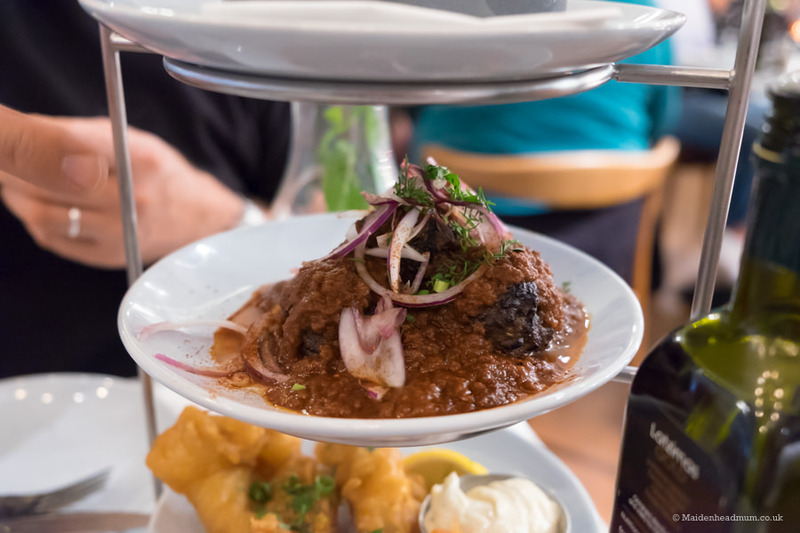 I was invited to review a meal for two at The Real Greek in Reading in return for an honest review on the blog. Maidenhead’s closest beach? 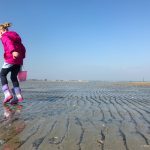 West Wittering explored. 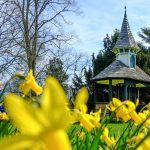 Twelve things to do in Maidenhead before you’re two.